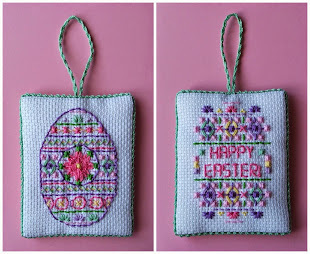 Eglantine Stitchery: Adventures in Embroidery! 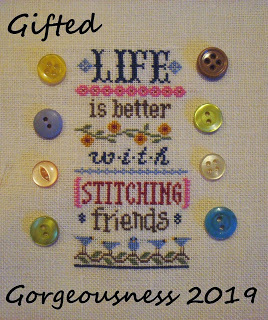 Hot on the heels of my last Stitchy Adventure, in Couching, I somehow got in into my head that I should try embroidery! 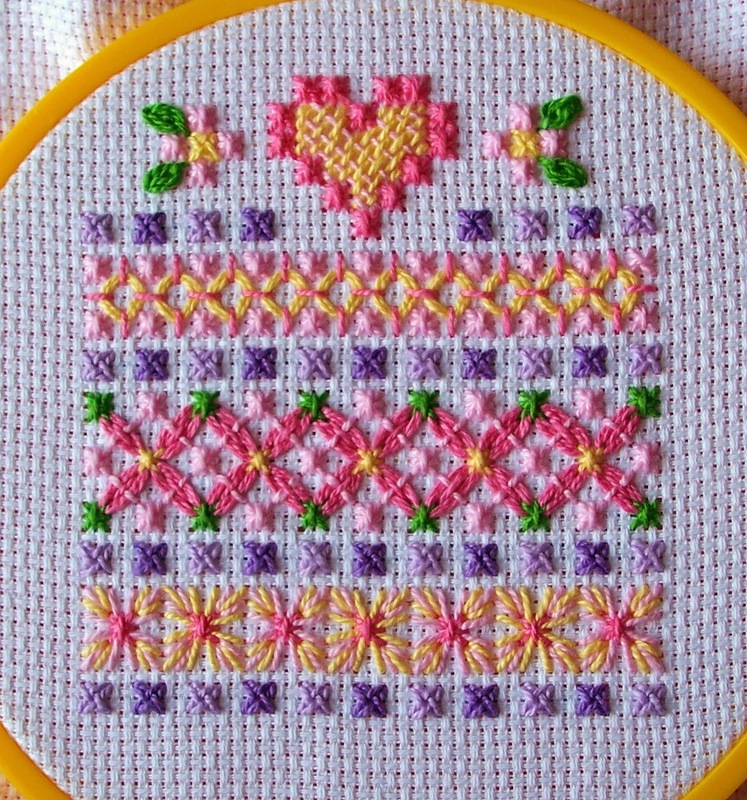 Now, cross-stitch is, in fact, a type of embroidery. But for all the years I've been cross-stitching, I have had a love/hate relationship with "real" embroidery. As in, I love the look of it but hate to work it. And on what is my irrational hatred based, you may ask? On a misbegotten, never-finished, free-form embroidery done in the hand (this was before I started using hoops) and discarded after much frustration, never to see the light of day again. I got as far as some sort of line stitch (whip maybe) and French knots. I didn't even make it to the lazy daisy stage! 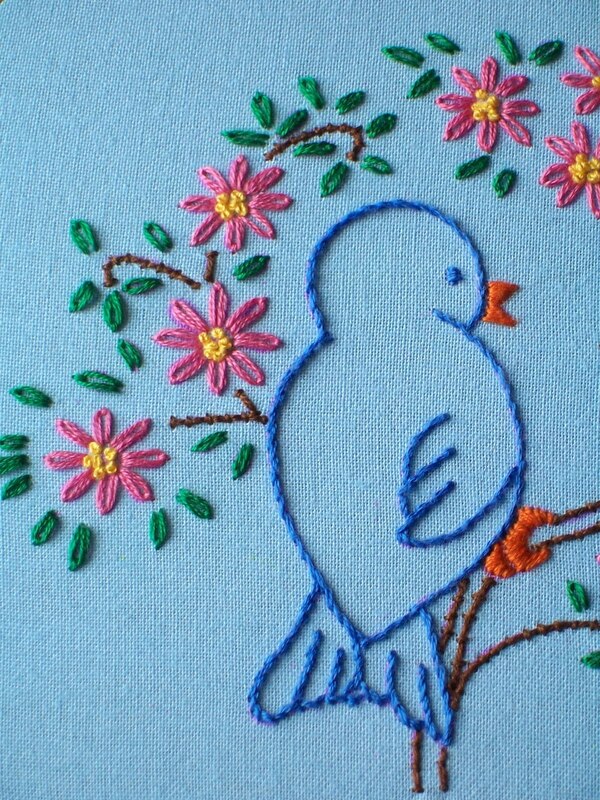 French knots. So innocent looking, all pretty and round and nestled neatly together in the centers of flowers. And yet so very evil. Oh, I tried to be patient with them! I have never been one to give up easily, and this was no exception. I made knot after knot in that scrap of fabric, and all of them ended up lopsided, or funny looking, or pulled too tightly (so tightly that I had holes in the fabric) or too loosely (so that they flopped over, never to rise again). And trying to wrap the thread around the needle? I don't even want to go there. And so, at the tender age of (if I remember correctly) eight, I acquired my first Stitchy Foe. And what a Foe! All these years, the French knot has plagued me! I never ever embroidered again, but it kept invading my stitchery, appearing in patterns I loved and just had to stitch, as flower centers and dots over alphabets, as eyes of creatures and persons alike; in borders, in backgrounds, in figures all over, the French knot surfaced cunningly in elements I could not leave out of the design! It would not leave me alone, and so I waged war. 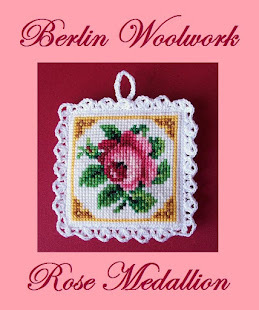 Yes, I took to slyly substituting seed beads where ever a knot occured, and when that didn't work, I would cross-stitch a filling, or some other clever disguise. 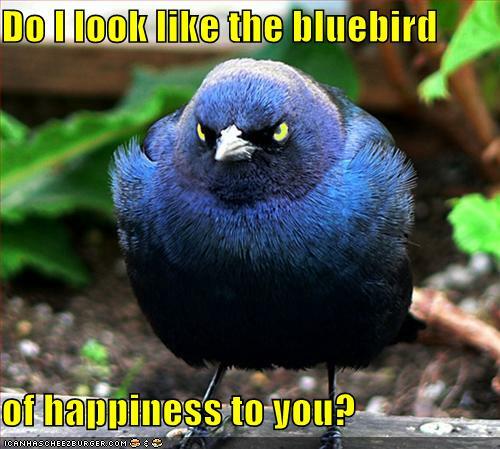 But it irked me. Oh, how the damnable, wretched French knot irked me!!! 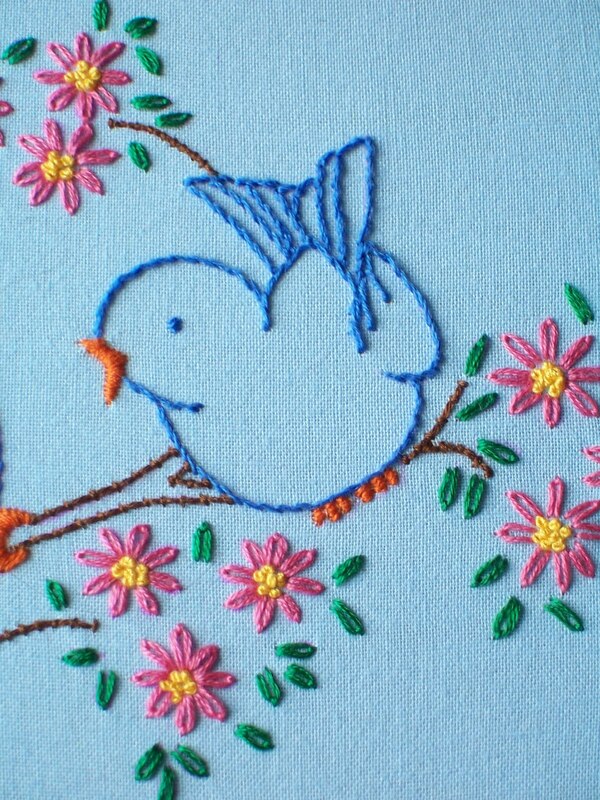 I despaired of ever stitching crewel work, the French knot's favourite stitchy style. And for every work I fashioned a substitution for that I was pleased with, there was one I was secretly not proud of, as I thought the French knot would have been better, despite its demonic, hellish nature. Therefore, when I bravely embarked on this Stitchy Adventure, I did so with great deal of anticipatory dread. As I mentioned in my last post, the gold loop-de-loops on my Twilight Angel's skirt are lazy daisies. And that's all the instructions said. No diagrams, no helpful tips. Since I had found my couching test piece so helpful, I decided that I would do a lazy daisy test piece too. 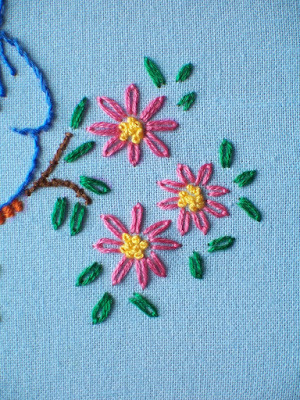 And so, I set about finding a hand embroidery pattern with a lot of lazy daisy stitches in it, and I hit the jackpot! 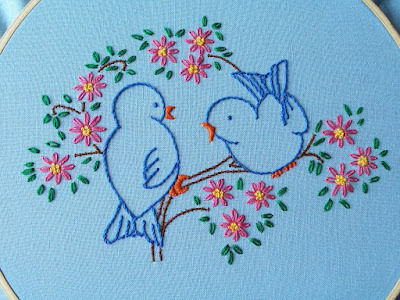 It turns out that there are a lot (and I mean a very great many) intrepid stitchers out there scanning in and posting vintage embroidery patterns. Some of them, admittedly, are very cutesy (e.g. 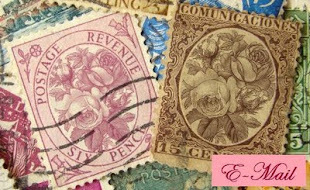 bonnet-wearing beribboned kittens curled up in flowered baskets), and others are just plain strange (e.g. the animated, dancing foodstuffs - tomatoes with legs and arms and eyes, waltzing with the cutlery). 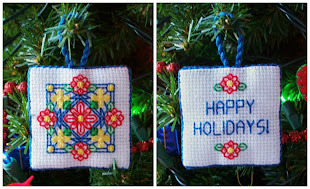 How did I conquer my dreaded Stitchy Foe and make those French knots so neat? Weeellllll. I did a test piece for the test piece. No, really. I actually did. 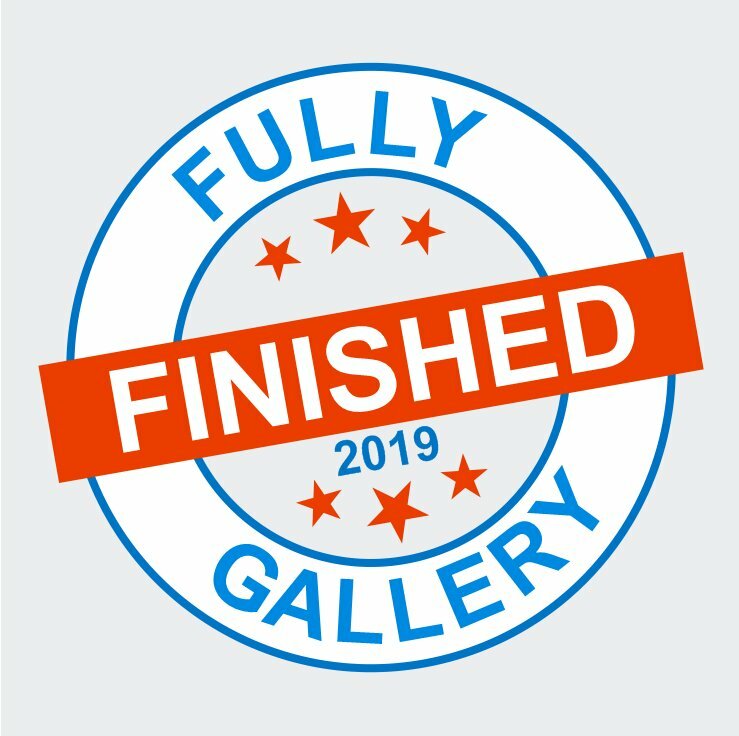 And was totally glad of it. I'm going to put up tons of pictures in the next post as proof! You may have noticed that there are no in-progress pictures of this work. This is because I was absolutely convinced that I, noted embroidery diaster creator, was going to mess it up irrevocably at some point. And I was afraid to jinx myself! The fabric is 100% cotton in a dark sky blue; since I wanted the branch to look like it was in the sky, that was a no-brainer. I choose all my floss colours to compliment it. 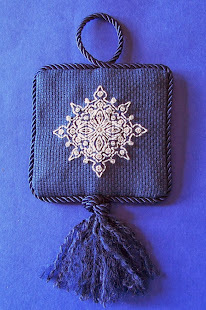 All stitches were worked with three strands of floss; all colour numbers are DMC. 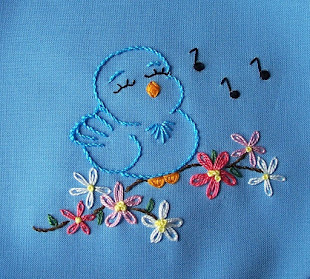 ~ The Bluebirds were worked in Stem Stitch with 798 (DK Delft Blue). ~ The Branches were worked in Couching using 801 (DK Coffee Brown). 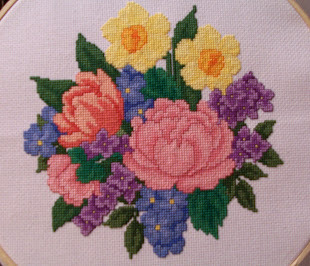 ~ The Flowers were worked in Lazy Daisy Stitch using 961 (DK Dusty Rose). ~ The Flower Centers were worked in French Knots using 743 (MD Yellow). ~ The Leaveswere worked in Lazy Daisy Stitch using 909 (V DK Emerald Green). The eyes of the Bluebirds were done in Satin Stitch using the blue (798). I omitted the wavy lines on the breasts of the Bluebirds. What impressed me most about hand embroidery is how fast it works up! I couldn't quite believe that I had the whole thing done in two days (and would have had it done in less time except I kept picking out my lazy daisies: it's very easy to pull them too tight and you have to keep your tensions a little loose to get them round - the very tight ones on the skirt of my Twilight Angel were done that way based on the model). After I got over my initial trepidation, I actually found the stitching - especially the lazy daisies - very fun, which was entirely unexpected! I also like the way that the long surface stitching in embroidery leaves sections of the floss free so that the lovely sheen of DMC shows in the stitched elements. 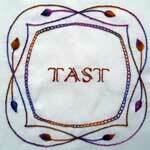 This is not something we often see as cross-stitchers, since our floss is tightly worked in the fabric. It's pretty! Honestly, I had a bit of of a hard time at first, especially turning corners with the stem stitch, and my lazy daisies could be a lot neater - I found it difficult to get them to met exactly at the end. And my satin stitch needs a lot of practice - while it seems like the easiest stitch from reading the stitch diagrams, I actually found it the hardest to work in the whole piece, as getting the strands to lie flat and working with the angle is very challenging! Overall, though, I'm quite pleased with it. I really like this bit of doing test pieces that can stand as projects on their own. It's fun, and useful to try out the techniques, and you have an actual work at the end instead of random scraps of fabric! This is something I can see doing more of. And, despite all my previous feelings to the contrary, I can actually see trying embroidery again. At least simple designs like this (and this and this). Ooh, french knots... I've looked up tutorial after tutorial, I've practiced and practiced and practiced and still about 98% of mine just unravel and I can't figure out why. 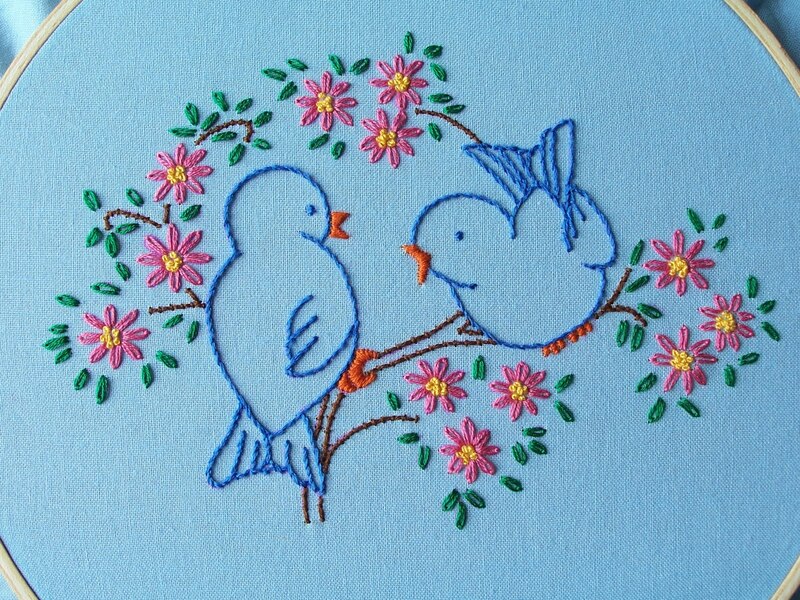 Your bluebirds look beautiful and your french knots so neat! 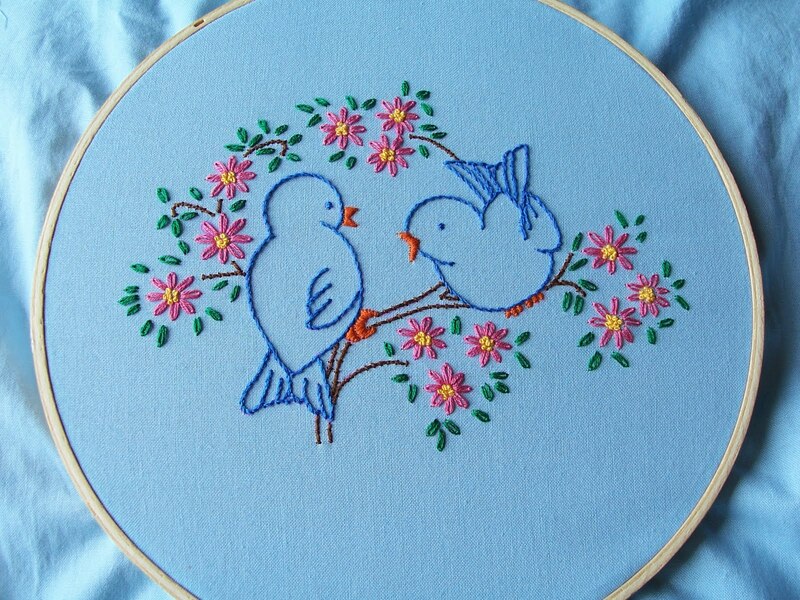 I can't tell you how much I love this embroidery! It's just so pretty and I'm in awe of your stitchy skills! I've wanted to do something like this for a while now, but it's definitely a bit beyond me! I do enjoy reading your blog. I'm not sure if I should mention that some of what you had written (about French knots) amused me greatly. I love the look of embroidery, but am a little timid of it myself. I have pieces that I started as a kid and never finished because I didn't like how they looked. These were some of the first pieces I've ever worked on as well. I remember getting frustrated with the lazy daisies, getting the stem stitch even and turning corners, and the satin stitches to look smooth, rounded and full. I like the idea of using 3 strands of floss because I'm pretty sure I only ever used 2 strands. You're little practice pieces are making me want to try it again. I have some iron on transfers in my stash, so, maybe I'll give it a go again soon. Thank you all so much for the lovely and very kind comments! So sorry that this response is delayed - my sincere apologies! Flossy: Ha! I thought you might ;) I just wish I could find the link to the dancing cutlery one; forks and spoons waltzing, lol! I'll keep an eye out for it. 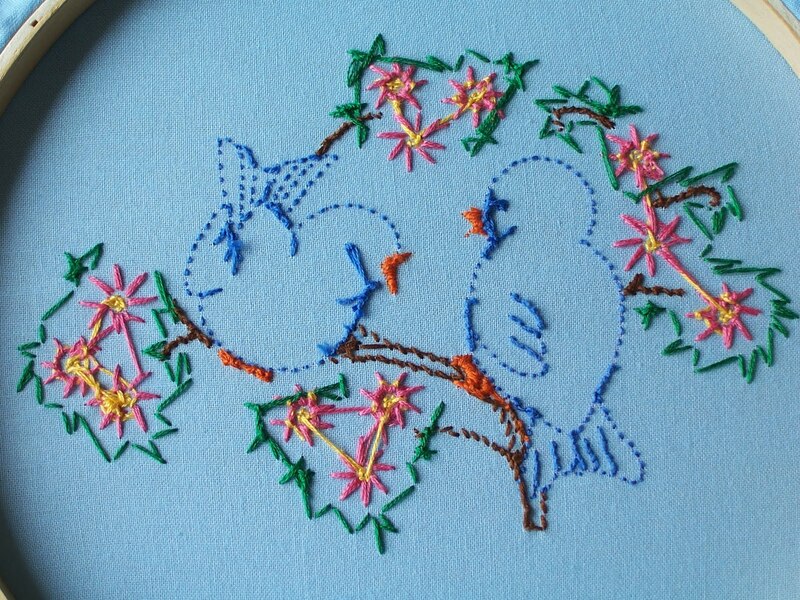 Rainy Day: Thanks so much for your wonderful kind compliments :) Embroidery is SO not beyond you! If I can do it, you can do it even better!!! I say find a pattern you like and go for it! I'm going to post up some vintage pattern site links soon. CS: Of course you can, silly! As I was writing this, I was thinking of you :) Not as rantish as my Whipstitch Diatribe, to be sure, but I'm very happy that you found it amusing nonetheless. Karen: I so understand your frustration. Turning corners isn't easy, at all. I definitely need more practice with that. And I always thought I would hate making lazy daisies - and I did, for the first few - but once I stopped pulling them so tight, I found it was a lot easier. I'm so used to tight stitching for cross-stitch that the laxness of some of the embroidery stitches is hard to get around. And 3 strands is the way to go. The little bit of extra fullness covers up the gaps and covers "a multitude of sins", as my Grandma says about icing and cake :) My first efforts were 2 strands too, and that extra thread makes a LOT of difference! I'm so happy that you think you might try your hand at a piece! I'd love to see anything that you decide to try. I'm thinking of doing some more small pieces like this, though I highly doubt that everything will go together as smoothly as this piece happened to; I just lucked out this time around. I hope you do too! WIP: Twilight Angel - Couching! Wowzers! 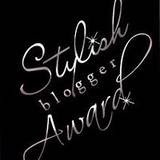 I Won an Award!